Reflections is the word that has been coming to me. 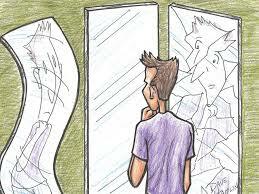 What do we see when we look at our reflection. Do we see our past and all of our mistakes? Do we see our present and current situations? Or, do we see our future and all the plans that God has for us? The only reflection that I want to see is the Christ that is in me. He has saved me, redeemed me, restored me, healed me, etc. He has put all the pieces of me back together when I was so broken that I could not even see. But He met me in my brokenness and He has restored my vision. My vision is now fixed on the reflection of the future. Like in my previous posts about Hope..
My vision of the future is not marred by the reflections of the past. God is now my present and my future and I know that nothing is impossible with GOD… I can expect the unexpected! This entry was posted in Abuse, FAITH, God, Inspirational and tagged Abuse, Domestic violence, FAITH, FEELINGS, Future, God's plan, Hope, inspirational, postaday, Victims, Wounded. Bookmark the permalink. Thanks for the comment and thanks for following. I try to write what God gives me each day and that was the primary message for today..hope, future, and Christ, as the Key– as always!….Not only do I want to see that in me, but I pray that everyone will see HIS LIGHT shining from me…Thanks again. My life verse….how did you know? Reflections…thanks Angel! Hey sis!! That was the word that was in my spirit.– reflections. I did not know, but God knew. Thanks for your support and encouragement. Love ya SIS!!! Amen! This is a wonderful message. It’s filled with encouragement, truth and hope in Christ Jesus. Blessings to you!! Thank you and thanks for following… I appreciate any comments as I begin this journey through this blog world that God has guided me to. Blessings to you too! You are welcome. I will be praying for this ministry you have and that many lives will be impacted. We cannot go wrong as long as we stay in Gods will. Blogging has opened many doors for me. It was God who led me here. It had been a blessing for myself and those that read the things laid upon my heart to share. * I thank you for following my blog as well. I appreciate the encouragement and support from you all. Bless you in abundance. Thanks again. and thanks for the prayers for Secret Angel Ministry. I have been following the “bread crumbs” that the Lord gives me guiding my path. My book should be released in August and only He knows what He has in store for me… Blessings to you and thanks again! I look at my past and praise God for His abiding presence and His enabling as He undertook for me in every area of my life. He has never let me down, so I know that no matter what comes now or in the future, HE is dependable and will ALWAYS use every opportunity to ‘grow’ me closer to His goal for me of Christlikeness. I look at my present and know it is the only time I have in this life, so I want to use every opportunity to His glory. I look at my future and rejoice in my Saviour and all He has waiting for me . . . but my heart goes out to those who do not know Him, and who, if He should come right now, will be eternally lost. Awesome and thanks for the comment. Walking in faith is the Key to everything in this world. Blessings to you and thanks for following my new blog as I walk in obedience as well to do what He has told me to do.. God bless you! !